Thomas Wallcut (1758-1840) arrived in Marietta on October 26, 1789 - on foot. He started from Boston, enduring a rough passage of twenty-four days to Baltimore on the schooner CAPTAIN SNOW. After 4 days recuperating in Baltimore, he started walking to Wheeling, Virginia (now West Virginia). He walked the 280 plus miles in 19 Days, an average of 15 miles per day. From there he hiked to Marietta in 4 1/2 days. Walking was not a typical mode of conveyance to Marietta from the eastern states. But then Wallcut was not your typical Marietta settler. Thomas Wallcut was a Massachusetts native, educated to be an Indian missionary at the Indian Charity School in Hanover, New Hampshire. He was accepted at Dartmouth College in 1774 but instead went to live with the St. Francis Indians (a division within the western Abenaki Indians) near Montreal. Wallcut worked in hospitals at Albany and Boston during the Revolutionary War. He used his earnings to buy one share in the Ohio Company of Associates which owned land in the Marietta area. He was a scholarly type yet sociable, curious, outspoken, and seemingly unfazed by the hardships of living in the new territory. He kept a detailed journal of his stay in Marietta from October 1789 to March 1790. The journal does not start until January 20. It offers fascinating insights into early life in the new settlements. Wallcut’s nephew George Dexter edited the journal and added helpful footnotes for background. Dexter described the journal book: “It is a compact little volume, five inches by three and a half and opens on the shorter edge. It is kept in a very neat and careful manner. Mr. Wallcut’s habits were methodical, and his handwriting almost a model for this generation of poor penmen.” Sounds like the poor (or no) penmanship of today in the 21st century. January 24: Visited the new settlement at "Belle Prairie" (today's Belpre, Ohio) down river from Marietta. Was impressed with the people he met there. Dined at Colonel (Alexander) Oliver's home: "had a good dish of boiled beef and pork, cabbage, turnips, potatoes, and Indian bread and wheat bread, and all served in a decent and handsome clean manner." "Farmer's Castle" fortified enclosure at Belle Prairie settlement built in January 1791 after Indian attacks in the area, from Wikipedia. This included the log homes of Col. Cushing and Col. Battelle whom Thomas Wallcut visited in January of 1790. Image from Wikipedia. February 10: Ohio and Muskingum Rivers were choked with ice which stopped all river traffic. February 22: "The (flood) water has abated so that Lucas and Neal and several more are moving back into their houses." Walcutt kindled a fire to dry the house where he was staying. It had flooded to "about four feet on the floor." February 3: Enoch Parsons was elected President of the debate society, Wallcut was secretary. February 16: "No meeting this evening. I fear ours will be but a short-lived society. They seem to have so little taste and animation for it that we evidently have the symptoms of decay." There was no further mention of the debate society in his journal. No law licensing and regulating taverns, etc. These points were debated by the jury members, though the outcome had no legal standing. The Ordinance of 1787 creating the territory expressly prohibited slavery, which should have satisfied Item 4. The Ohio Company had already made some provisions for needy persons, the complaint mentioned in item 2. Wallcut was dismayed that juror Jonathan Morris passionately spoke in favor of dueling, stating that ..."every government ought to encourage duelling." February 6: "Employed myself in chopping wood. I feel best those days which are partly improved in exercise." February 19: Wallcut went to Dr. True's "pest house." 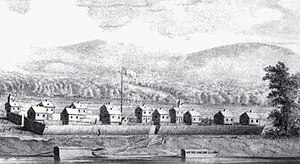 Smallpox appeared in Marietta in January of 1790. Some houses were built away from others for care and to quarantine persons who contracted smallpox. Such buildings were referred to as pest houses. Wallcut does not explain why he went there; it might have been temporary shelter from the flooding. 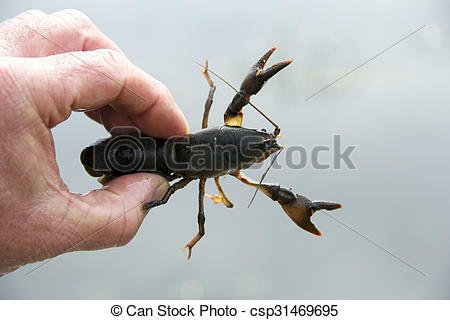 February 22: "The doctor (Wallcut referred to "the doctor" often but did not give his name) showed me, as a natural curiosity of the country, a complete lobster in miniature about two inches in length...They are found in plenty in streams and springs of water." The "lobster in miniature" was a crayfish, or in local terminology, a crawdad. February 25: Attended a meeting of agents (a group representing shareholders) of the Ohio Company. They discussed finances but spent most of the time debating policy about salt springs on the Scioto River. Wallcut’s notes suggest that this was a controversial topic. It was also mentioned at other meetings, including March 2 when Wallcut himself was quite vocal on the subject. Topics at other agents’ meetings included finances, land surveys, Donation Lands, and employment of Daniel Story as a preacher for the settlements. Wallcut met Reverend Story and wrote a note of support for employing him. By early March, Thomas Wallcut had decided to leave Marietta and return to Boston. He gave no reason; it's possible that he never intended to stay. But his detailed study of the Ohio Company's records and serious inquires about Donation Lands for himself suggested some level of interest in the new settlement. March 4: Wallcut seemed apologetic about his conduct at a March 2 agents' meeting regarding the salt springs debate. He separately asked Colonel Meigs and Colonel Battelle what they thought of his behavior at the meeting. Both offered favorable comments. March 6: Paul Fearing was a friend who expressed regret about Wallcut's departure and wanted him to return. Wallcut listed many others who were complimentary or respectful of him, including "Colonel Oliver, Colonel Meigs, Captain Prince, and Mr. Gridley,....Commodore Whipple,...Major White, Esquire Wells and his sons, Mr. Rockwell, Mr. 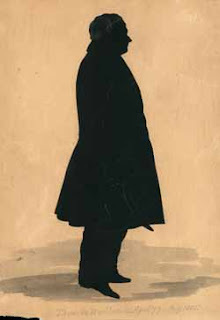 Bent, Messrs. Buell and Munsell, Colonel Battelle, Messrs Mills, Barker, Mr. Story and brother, Captain Shepard, Mr. Skinner, Mr. Tilas, Skinner, Parsons,...He stated that their favorable opinions "affords me great pleasure and gives me satisfaction..."
On March 8, he began his trip east to Boston with the doctor, and two men named Dodge and Proctor. They walked, navigating crude roads in very rough condition, and lodged mostly in homes or road houses along the way. They often made 15-20 miles per day. That is quite a distance for persons not normally accustomed to walking. He suffered from leg and feet soreness along the way, but except for one day of rest, pressed on. READER ALERT: POSSIBLY DISTURBING LANGUAGE JUST AHEAD: On March 15, Wallcut was attacked by what he called "thoroughgonimbles." Thorough Go Nimbles was slang for diarrhea. Loosely (so to speak) translated, the phrase meant "goes through quick." A 1903 slang dictionary listed other synonyms for the condition: squitters, wild squirt, and back door trot. Fortunately, this situation persisted only a few hours. Wallcut did not return to Marietta, though he occasionally inquired about the parcels of area property that he owned through his share in the Ohio Company. He forwarded money for taxes on the properties but never occupied or developed the land. He finally transferred the parcels to Nahum Ward in 1838 for the price of $100. Wallcut was devoted to antiquarian research and was a founding member of the Massachusetts Historical Society. His day job was clerk at the State House in Boston, a job he held for forty years. We are indebted to Thomas Wallcut - and his nephew George Dexter - for preserving this fascinating snapshot of life in early Marietta.